To the casual observer, Exquisite Pressure seems like an exercise in difficulty for the sake of difficulty: The program gives actors only 30 hours of rehearsal time to put together a production led by professional directors. If this idea of putting on a show in the span of five days is not already daunting on its own, attempting a production of Molière’s famous The Misanthrope in this manner is almost foolhardy (although it is worth remembering that UChicago is an institution known for its celebration of rigor). 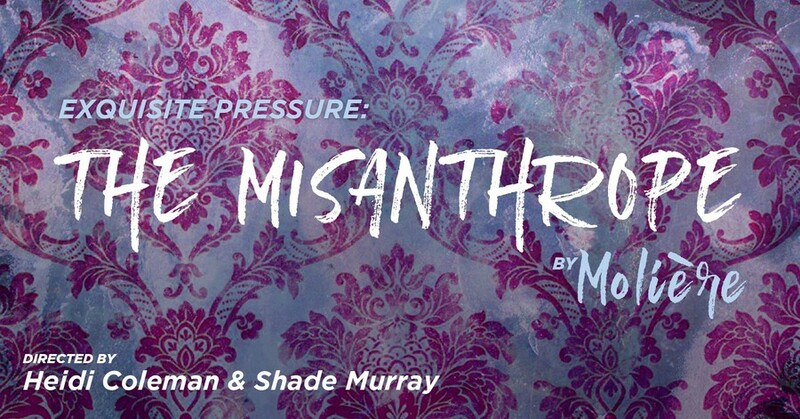 Yet from the play’s opening to the final bows, it was abundantly evident that Exquisite Pressure’s The Misanthrope is a standout example of University Theater (UT)’s potential. Directed by Heidi Coleman, director of undergraduate studies and performance programs for Theater and Performance Studies (TAPS), and Shade Murray, a director at Steppenwolf Theatre Company, the play provided a welcome change of pace from the TAPS department’s usual programs. Molière’s The Misanthrope, or the Cantankerous Lover was first performed in 1666 in Paris and remains his best-known work. This comedy satirizes the hypocrisy of societal conventions by using the complaints of its dynamic protagonist, Alceste (fourth-year Tempest Wisdom), to his friend Philinte (second-year Hana Eldessouky) to critique the superficiality of French aristocrats and their penchant for gossip. However, Alceste is not immune to the frivolity of society, as his romantic interest Célimène (third-year Margaret Glazier) embodies the essence of the flighty and flirtatious actions prevalent in their social class. The relationship between these two dynamically opposed characters and their interactions with a lively ensemble bring life to the play. The talent of every actor was clearly demonstrated through the numerous battles of wit in which the characters engage. The exchanges between Alceste and Célimène are some of the highlights of the production, showcasing the pair’s conflicting roles as well as the depth of their personalities. Alceste goes from an arrogant and pretentious character who disdains society to a flawed and sympathetic individual who tries to determine how to live in an irrational society. Meanwhile, Célimène starts off as a playful and vivacious woman who has no interest in Alceste. Instead, she courts three men at the same time. Yet after her simultaneous courtships are revealed and the three men leave in disgust, Célimène’s plea for forgiveness shows that she is a product of the society she lives in. While she may be flirtatious of her own accord, Célimène cannot be blamed for her own nature. Wisdom and Glazier do an excellent job of providing nuanced portrayals of these characters, creating well-rounded and sympathetic individuals to whom the audience can relate. The other highlight of this production comes from the performance of the three lords who compete for Célimène’s attention: Oronte (graduate student Laurence Warner), Acaste (third-year Jacob Goodman), and Clitandre (second-year Leonardo Ferreira Guilhoto). Warner stood out as Oronte, capturing the spirit of Alceste’s criticism while remaining endearingly oblivious, even as Alceste disparages his poorly written sonnet. Oronte never lost the attention of the audience, using a combination of comedic dialogue and facial expressions to create a simply inspired character. Similarly, the double act of Acaste and Clitandre had the audience laughing after almost every line or extravagant motion. Their ostentatious personalities blended together to create a comedic duo reminiscent of Laurel and Hardy, or Shakespeare’s Rosencrantz and Guildenstern. While there is no doubt that Alceste and Célimène are the play’s main characters, the three actors portraying the comical lords stole the show in this production, highlighting the importance of creating a strong ensemble. “[I would] love to continue expanding the program more and more in coming years, while not taking away from the other opportunities found within University Theater,” Coleman said. The beauty of Exquisite Pressure is that it gives student actors the opportunity to work in an intensive exercise meant to push the limits of their ability, while allowing them to be a part of student-directed shows at the same time (several Misanthrope actors are in other UT plays this season). As was clear on Saturday, the nuanced performances by each of the actors and the overall success of the production put some of University Theater’s best work on display. The Misanthrope goes above and beyond its goal of creating a show in 30 hours. If the future of University Theater features the same talent and ambition as Exquisite Pressure, we can look forward to superb performances to come.